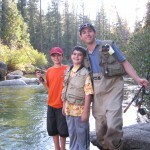 First time this year, up the Sonora pass on the Stanislaus along with Peter, his son Ari and his bud Gavin. Loads o’ fun. 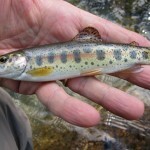 Caught a 17″ trout and a 9″, but the prettiest was a little guy, probably native rather than planted. 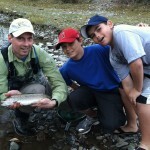 This entry was posted in recreation and tagged fishing vacation friends. Bookmark the permalink. Post a comment or leave a trackback: Trackback URL.